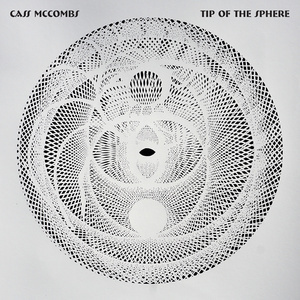 Cass McCombs' Tip of the Sphere is as intricate as any of his work before it. Regardless of his approach and whether or not he intends to share much of it with the public, it's clearly one that works for him and his fans. Even among lesser-known musicians, bandleader Cass McCombs is unique. Like cult artists Ariel Pink and John Maus, the durable singer-songwriter's fandom is as fervent as it is specific. McCombs makes the kind of studied music that rips effortlessly through distinct genre influences, carrying with it the potential to both astound and alienate. But his music also has a mainstream charm to it. Whereas one might reasonably dismiss Pink or Maus on the grounds of gimmick or melodrama, McCombs' music is smooth and inoffensive enough to thrive in any space. At least upon first listen. Still, the sentiment remains — "Bum, Bum, Bum", a single off of 2016's Mangy Love, is the kind of fluid, undeniable hit that could reasonably fit on the soundtrack to just about any indie movie. Never mind the fact that McCombs' lyrics rhapsodize about "blood in the streets", "centuries in the distant mist" and "white bread artists", invoking the harsh realities of racism and war. The song is brilliant in its deceptive simplicity. Perhaps it's this idiosyncrasy, or this blending of beautiful and horrendous elements, that contributes to the singer's fringe acclaim. McCombs' newly released Tip of the Sphere, his ninth full-length, doesn't dispel this notion. It, too, has its fair share of groovy tunes offset by quirky, at-times baffling lyrics. If there's another musician who combines this laid-back, anything goes aesthetic with tongue-in-cheek songwriting, it's Kurt Vile (Fitting, then, that McCombs helped produce Vile's record last year. ), but McCombs' latest isn't as insular or hazy as much of Vile's output, instead focusing on big band instrumentation and good old-fashioned jams. It's mostly a straightforward rock record, despite the fact that McCombs' voice and storytelling more closely recall the earnest croonings of folk and blues singers. As ever, the singer is impressively chameleonic. There's not a sound in the guitar music canon that he hasn't tried to emulate. Opening the record is the rambling seven-minute track "I Followed the River South to What", which pairs a simple, repeating guitar riff with the hook "If I had your dollar, I'd show you what I mean / I'd show you what I mean." It seems to speak to McCombs' persona as a nomadic artist, imagining a conversation between an unburdened hippie who lives out on the street and a judgmental onlooker who can't grasp his freedom. "The Great Pixley Train Robbery" is a different kind of songwriting, forgoing hooks for a more Bob Dylan-esque approach to storytelling. The single "Estrella", a tribute to the late Mexican artist Juan Gabriel, is likely to be the biggest hit out of the bunch, with its effortless interplay between McCombs' guitar and Dan Horne's bass. ("I built a ribbon out of moss, plain blue moss / And presented it to you on your birthday," he sings in the opening lines.) "Absentee" and "Real Life" are both slower tracks, with the former leaning into piano balladry and the latter into a propulsive rhythm featuring a sound that recalls a bubble rising to the surface of an aquarium. "Sleeping Volcanoes", the record's first single and its thematic centerpiece, has the most memorable lyrics across the album's hour of music, and it might also be the most dynamic of all the songs. In the track, like with "Bum Bum Bum", McCombs contemplates an upcoming apocalypse — "Help me Armageddon, help me Armageddon / Help me to be calm", he intones — with the kind of cheeky calm that masks an obvious sense of anguish. The first half of the record is its more accessible half, but McCombs, as ever, isn't interested in grasping for approval. The songs, especially "Estrella", are catchy and memorable, but in them there's very little recognition of current musical trends. Anyone familiar with the songwriter already knows, but the 40-something isn't by any means chasing the charts or expecting radio play. Mangy Love was perhaps his most widely appreciated work to date, but that in no way means McCombs is trying to bring that fact into the music-making process or to capitalize on his newfound success. If Tip of the Sphere goes mainstream at all, as it could, it'll likely be at the hands of other appreciative artists. (His song "Dreams-Come-True-Girl", from 2009's Catacombs, was just featured on Netflix's Russian Doll.) But all this is hearsay to McCombs, ever withholding and enigmatic, who maintains, over a decade and a half of releasing music, that the music itself is what matters. The second half of Tip of the Sphere is the less accessible half, but it's no less rewarding. The dubiously titled "Sidewalk Bop After Suicide" has the kind of guitar riff that can get stuck in your head for days, though its lyrics position it as a kind of loner anthem. "Prayer for Another Day" and "American Canyon Sutra" are more meditative, leaning more closely into experimentation and spoken word. "Tying Up Loose Ends" is one of the quieter songs on the record, but it's also one of the most emotionally potent. The closer, "Rounder", allows itself the kind of indulgence that fits in well at the end of a record, but it's a selfless kind of indulgence, as much of the 10-minute track is an elongated showcase for the band's chemistry. After all these years, one could suggest that McCombs has found himself some kind of comfortable stasis. Maybe that's true. But the nuances and intricacies of each of his records tell a different story, even if it's not a story he hands over on a silver platter to journalists. If the musician is stingy about his public persona, it likely takes the form of a shrug more so than a middle finger. Regardless of his approach and whether or not he intends to share much of it with the public, it's one that works for him and his fans. Nine records and counting, McCombs is as magnetic and unmistakable as ever.